PREVIOUSLY extinct from mainland Australia for almost 50 years, eastern quolls are making a long-anticipated comeback, thanks to the combined efforts of numerous conservation and wildlife groups, government departments, and researchers. It is the first time an extinct carnivore from mainland Australia has been reintroduced to the wild. The small, spotted critters vanished from sight in New South Wales during the 1970s, only surviving in Tasmania - until now. 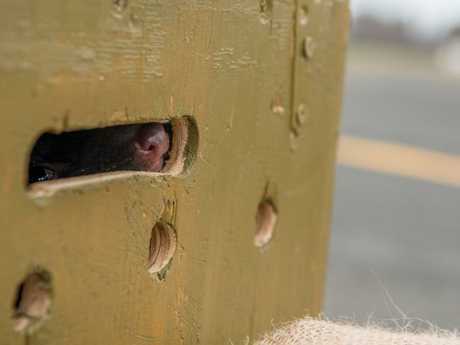 On Tuesday evening, a group of 20 of the cute carnivorous marsupials were released into Booderee National Park, on the south coast of NSW. "It was a long day, but a very exciting day," said Darren Glover, the head of living ecosystems at the World Wildlife Fund (WWF). 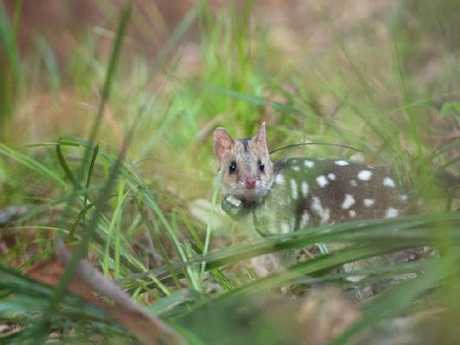 "For thousands of years eastern quolls played a part in the ecosystem as primarily insect eaters. It will be fascinating to see what happens when they return to that role at Booderee," he said. 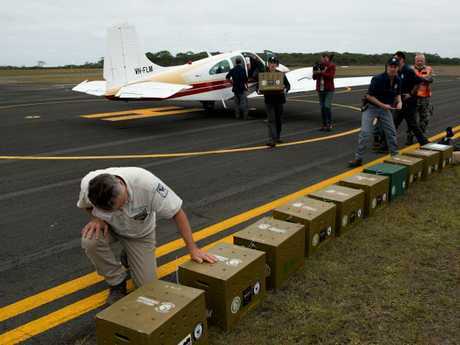 The historic event was the culmination of several years' work by the Australian Government, World Wildlife Fund (WWF), Rewilding Australia, Booderee National Park and its traditional owners, ANU and many others. "Eastern quolls used to occur throughout much of southeastern Australia, but because of the introduction of the European red fox, they [have been] limited to Tasmania," said Booderee National Park Natural Resource Manager Dr Nick Dexter. He said the eastern quoll was reintroduced to Booderee National Park because the habitat of the region "resembles the habitat of the last known specimens in NSW". The park is also the ideal new home for the quolls since the number of foxes and other feral animals have been dramatically reduced. "We've been able to release these quolls safely thanks to the unbelievable hard work of Booderee's rangers, who have spent the last 15 years undertaking serious feral predator control in the park and surrounding region," said Assistant Minister for the Environment Melissa Price. 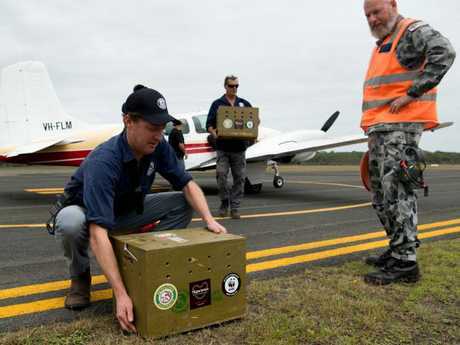 And their dedication is paying off, with a number of "locally extinct" and endangered animals being successfully reintroduced into the park, including long-nosed potoroos and southern brown bandicoots, along with other native species such as long-nosed bandicoots, brushtail possums, swamp wallabies and a range of ground-nesting birds. "Translocating species can be a long and difficult process, but the rewards are high," said Dr Dexter. While the captivity-bred quolls will face a few challenges in the coming weeks, such as finding food and shelter and learning to avoid predators, he is confident they will adapt quickly to life in the wild. 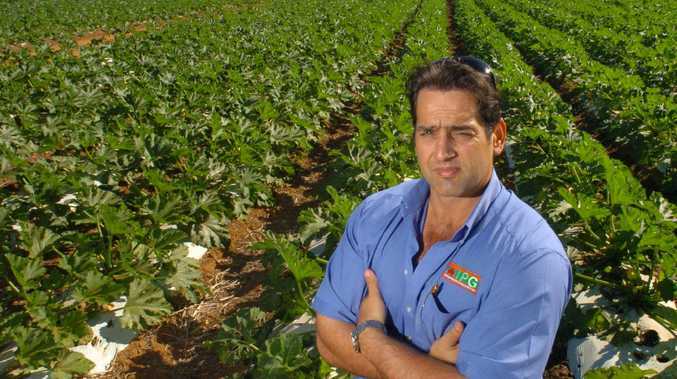 "We're putting out some supplementary food for them for a couple of weeks, but after that they'll have to fend for themselves." According to the Assistant Minister for the Environment Melissa Price, the Australian Government had contributed more than $2 million to Parks Australia through the Threatened Species Commissioner for projects like this, and she has encouraged everyday Aussies to get involved in this momentous project. "Everyone can help right now by simple actions," said Ms Price. These include, "not littering, being careful to stick to the tracks in national parks rather than disturb habitat, creating your own native backyard to attract our beautiful birds and mammals, and reducing your own waste by reusing bags and recycling". Mr Glover said another way people can assist our native wildlife and ecosystems is by simply keeping pets indoors so they're not a threat. "Cats make great pets and great companion animals, but the safest place for your cat is inside with you, not outside," he said. For Dr Sally Box, Threatened Species Commissioner, the program is a shining example of governments, NGOs and the science community working together to deliver results. "These programs offer the opportunity to restore some of the natural process to these ecosystems and get ecosystems back into balance," she said. But, one of the most valuable outcomes is providing Australians the opportunities to see these unique species in person. "The introduction of programs like this can help reconnect Australians with species that they haven't seen in their backyard in their lifetime," Ms Box said. Mr Glover agreed:"So many native species, like quolls, are unknown to so many Australians and it's a great shame." He said that while it's upsetting that we're losing these native animals, perhaps what's even sadder is that "many Aussies don't even know about them". The released quolls have been fitted with GPS collars so their progress can be carefully tracked and monitored by ANU researchers for the next three years. Up to 40 more quolls are expected to be released into the park next year, with the specific number dependent on how well the initial population flourishes and grows, said Mr Glover. With more projects like this one underway and a growing awareness of the threats our native animals face, the eastern quolls and other endangered species are facing a brighter future.